The results of the Razoo Speed Granting competition sponsored by Facebook.com show Amman Imman making a strong finish in 3rd place! Although Amman Imman did not top the other organizations to win the $1000 grant, we did manage to surge ahead and maintain a strong lead for an easy third place due to up-to-the-minute midnight efforts of students from Charles E. Smith Jewish Day School, Bethesda-Chevy Chase High School, Yale University and East Catholic High School, as well as the many individuals who sent links to their friends before the midnight hour and over the previous two weeks. I sat with three three high school students, Matthew Grossman and Max Gelfond from Charles E. Smith Jewish Day School and Lia Clearfield from Bethesda-Chevy Chase High School as they furiously typed emails to friends on Facebook, copying and pasting text at a feverish pace and asking those who were currently online to VOTE NOW. As a result of the efforts of these students, Amman Imman votes began to soar way ahead of the 4th place entry. Top recruiters included Matthew Grossman with 11 recruits, Audrey Scott from East Catholic High School with 6 recruits, Kristine Berzins from Yale with 4 recruits. (I am sure there were other recruiters but those were the only ones the application allows me to see). What does this prove? That a small committed group of disparate individuals who don't even know each other can pull together for a cause of common interest and actually make change happen. In this case, the change was in numbers, but we can extend this toward the potential for change in places like the Azawak of Niger when people of different backgrounds, timetables and interests come together and focus their energies. We can make a difference! The fact that Amman Imman placed well ahead of recognized initiatives from long-standing and established organizations proves what can happen when we put out a Call to Action. In less than two weeks, the Amman Imman community coalesced, enabling the Amman Imman proposal to surge ahead of other deserving groups. Once the call went out, the response was tangible. Although we did not win first place, we managed to create a buzz and a name for ourselves among these other worthy causes, casting a larger light around the cause of bringing water to the Azawak. The last-minute fever manifested by students mirrors the recognized urgency of the need for the people in the Azawak to gain access to water. The hearts of people inspired to "virtually" combine their energies mimics the spirit of the project that moved Ariane to begin it in the first place. She could not turn away from the need she encountered and the call of the people. We thank all our friends and supporters who responded to this call and voted. Razoo.com provides other opportunities to tap into the resources of the internet and generate further exposure for Amman Imman. 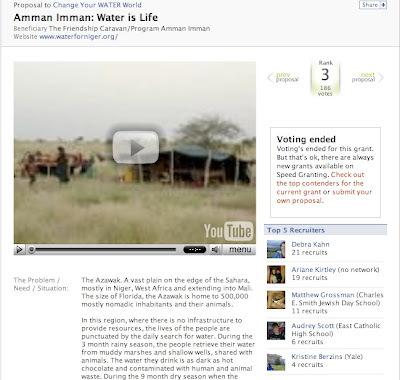 To increase Amman Imman’s visibility, I have created a group on Razoo.com called Amman Imman : Water is Life. I invite you to join this group and use it to tell others about the crisis in the Azawak and Amman Imman's mission to bring water and hope. To join this group and then recruite others, please go to this link on Razoo.com : http://beta.razoo.com/groups/amman_imman_water_is_life. A borehole in Tangarwachane now provides access to clear, clean water for the people there. Many more boreholes are needed in the Azawak. Let's inspire a worldwide call to action and spread awareness of the plight of the people in the Azawak. Let's make change happen. Congratulations on generating such great buzz for your cause, and for mobilizing your community towards action. You should feel free to continue to enter the SpeedGranting competition, as it runs every two weeks. We really appreciate folks like you and your group who use their energy for positive change. Thanks for your good works!